If you have a fear of heights, you may not want to look at the next few photos. 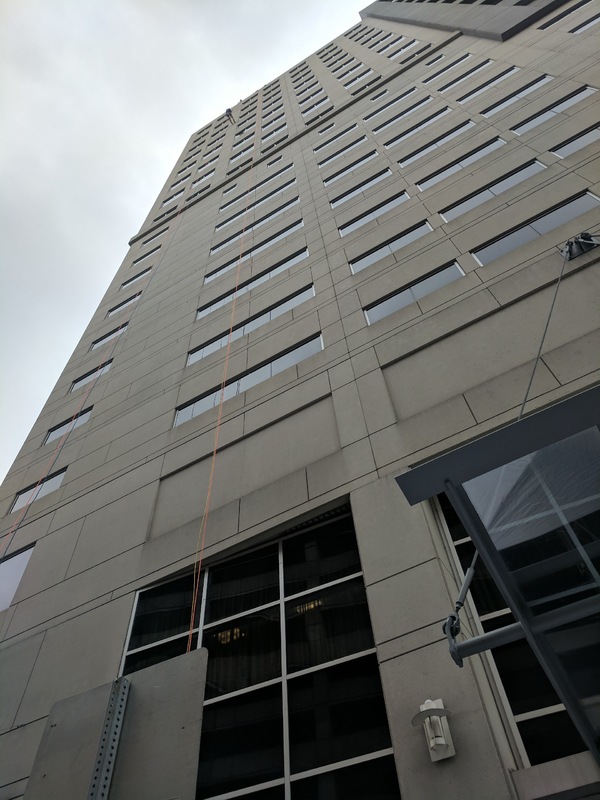 Yesterday I had the super fun opportunity to volunteer at a fundraiser called “Over the Edge.” Basically, you pay $1000 (nope, that’s not a typo) to rappel down the side of an 18 story building. That equals about 240 feet. 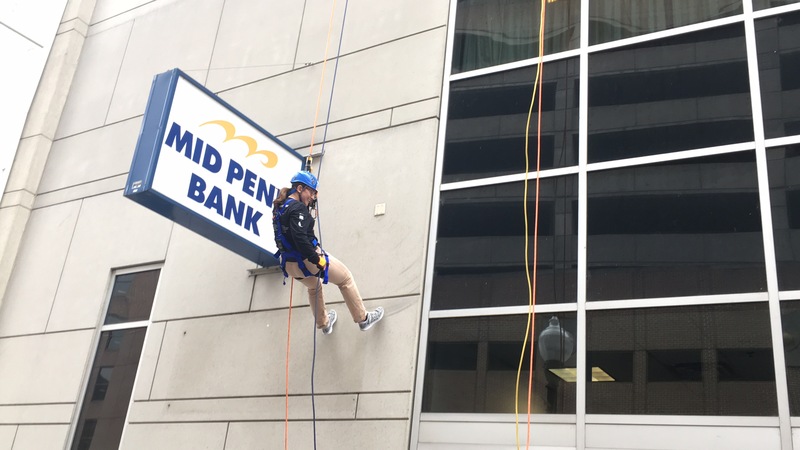 I was on the media team so I got to watch everyone come down the building for about seven hours and then interview them at the bottom. With about an hour to go, someone told me that volunteers were allowed to go up if they had an opening. Now, I’m not one to ask if I can do something for free when I know it costs $1000. That’s a little outside of my comfort zone. So two other volunteers who heard that I’d be interested decided to drag me over to the leader of the event and ask on my behalf. Fortunately I’d just gone to the bathroom because I felt like I might pee myself. My reasoning for going through with it was basically, “Well, I’ll be mad at myself later if I don’t do it.” You know, a really solid thought process and excellent reasoning for doing anything. Not, “I really want to do it”- like a normal person. So they got me all geared up and walked me to the roof. The guy who trained me on the rappelling equipment was super nice and helpful. He got me all hooked up and was like, all right, it’s time to go. In the back of my head I remembered that they told me that two people on the roof would check my equipment before I went down….and only he had done it. I could tell that he was trying as hard as possible to be polite and not just glare at me as I questioned his abilities, but he kindly brought someone else over to just stare at me for about three seconds and tell me I was okay. Then…I squatted over the edge (without looking down, I’m not a maniac) and I squeezed the lever to let me down. It wasn’t until about 40 feet down that I realized that I should look at something besides my feet because there was a whole city around me. As I glanced around, I remembered that I don’t really like cities, I was way too high in the air, and my feet were wearing my favorite pair of sneakers. This seemed like an excellent reason for me to keep my eyes on my cute feet rather than the drab cityscape with its gray buildings and teeny tiny people below. I kept thinking that I’d suddenly drop since every time that I’ve ever rock climbed my belayer found it really funny to let me drop a few feet really quickly so I screamed. Strangely, it was a very peaceful experience though. So you see that little dot in the top left corner? That’s my booty! And in case you don’t believe me… here’s me when I got closer to the ground. A freestone peach is one that the pit does not stick to the flesh of the peach. It comes out really easily when you cut it. A clingstone peach is one that the pit does stick to the flesh of the peach. The picture above is a clingstone that I didn’t realize was a clingstone. There is no way to know just by looking at your peach if it is a clingstone or a freestone, but if you go to a farmers market for your fruit, they usually have the freestone peaches set apart and labelled or at least can tell you which ones are freestone. The peach that I have the tutorial for below is a freestone. Here’s a quick tutorial from someone else who figured out a good way to cut clingstone peaches. 2. Gently press your knife into the top of the peach. Keep your knife still while using your hand to turn the peach so you can make a single slice the entire way around the peach. 3. Turn your peach slightly and repeat this process until you have the number of slices you want. 4. Place your thumbs where all of your slices meet and pull out to remove the peach from the pit. 5. Get rid of the pit, and enjoy your peach slices! Hey friends! Thanks for reading. Leave me a note in the comments if you have a favorite recipe to use peaches in or have an idea for what adventure I should have next!